Outdoor Fall Family Special at Larissa Photography. We are booking sessions weeknights between 3pm and 6 pm and limited slots on Saturday mornings. 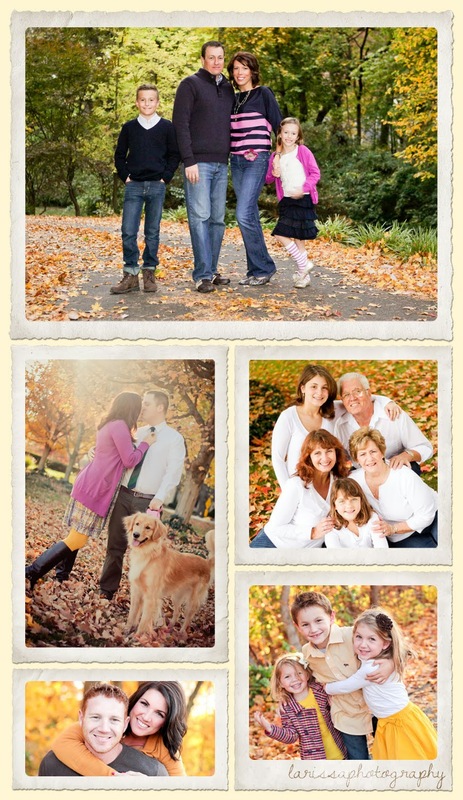 During your 30 minute session, Larissa will take 20 - 40 shots of your family outside on our 1.5 acre studio grounds where we usually have several trees/areas displaying fall color. Or, you may opt to have your photos taken on-location within 10 miles of the studio for $100 more. Larissa will start with group shots, then move on to breakdowns (individuals, couples, kids only, etc) as time allows. Talk to Larissa about the style of images you want including traditional posed pictures, casual poses, and candid/journalistic style images. You will likely get a mix of these, but Larissa can focus on whichever styles are the most important to you. 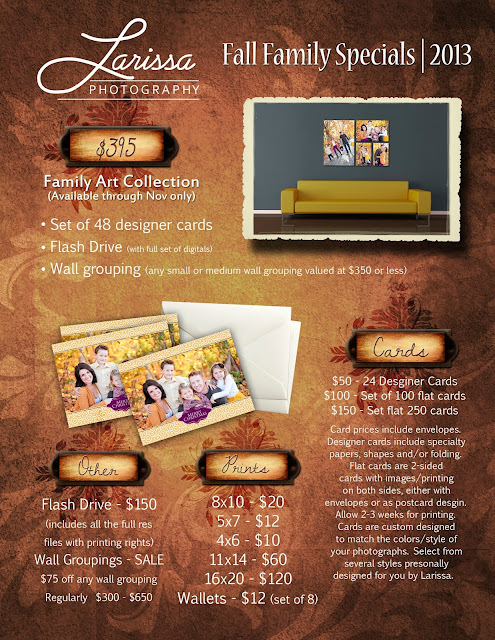 After your session, you can order prints a la carte online, wall groupings, digital files, Christmas cards, or our special family art collection which is available through November only. Keep in mind cards take 2-3 weeks, so be sure to order in time to mail them out before Christmas!